"Part picture book for pleasure reading. . . . and part practical how-to, this dramatic account is the next best thing to setting up a hatchery of your own." -- FAMILY FUN When a mother brings her daughter to a pond to collect some frog spawn, the little girl isn't sure what to expect. Day after day she checks on the jellylike bubbles until the black dots in their centers turn into slippery tadpoles, sprouting bumps that turn to stumps that become legs with webby feet. The engaging narrative and colorful illustrations accurately evoke each stage of a frog's growth, in a story that will inspire children to roll up their sleeves and experience firsthand the wonders of the natural world. Though youngsters fascinated by frogs may be drawn to this text on their own, it will make a most rewarding read-together or read-aloud to a class. A hopping-good collaboration. --School Library Journal (starred review) Part picture book for pleasure reading (it's a natural, with its bright, inviting illustrations) and part practical how-to, this dramatic account is the next best thing to setting up a hatchery of your own--a fun project that the book is likely to inspire. 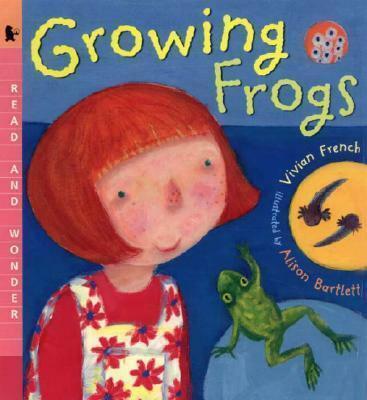 Vivian French has a lot of experience growing frogs. Every spring when her daughters were little, they visited the pond next door to collect some frog spawn and watch the tadpoles hatch. She says, "My cat was always very interested." Alison Bartlett says that before she started working on the illustrations for GROWING FROGS, she thought frog spawn was "disgusting." Now she thinks it's amazing!